An antigen is a molecule that stimulates a response from the immune system, such as bacteria, viruses, foods, toxins, and foreign cells. The word originated from the notion that antigens can stimulate antibody generation. It is now known that the immune system does not consist only of antibodies. The modern definition of antigen encompasses all substances that can be recognized by the adaptive immune system, which includes both the antibody-based humoral immune system and a system that does not utilize antibodies, the cell-mediated immune system. The basis of the adaptive immune system lies in the capacity of immune cells to distinguish between proteins produced by the body's own cells (those of the original organism), and proteins produced by invaders or cells under control of a virus (what is not recognized as the original organism). The immune system is one of great complexity, adaptability, and coordination. An antigen can be innumerable different kinds of foreign invaders. Yet, the immune system can recognize these millions of different antigens and neutralize or destroy them, while at the same time allowing helpful, symbiotic bacteria, such as E. coli, to become established within the human body. Even though all the various white blood cell types have a different responsibility, they all function together in the recognizing, attacking, and destroying of bacteria, viruses, cancer cells, and all substances seen foreign. On the other hand, an allergen is a substance that induces an allergic reaction, an abnormally high or misguided reaction by the immune system to a specific antigen that is normally harmless. This typically detrimental reaction may result after exposure via ingestion, inhalation, injection, or contact with skin. A tolerogen is an antigen that invokes a specific immune non-responsiveness to subsequent doses due to its molecular form. If its molecular form is changed, a tolerogen can become an immunogen. The adaptive immune system, also called the "acquired immune system," and "specific immune system," is based on immune cells termed leukocytes (white blood cells). It ensures that animals which survive an initial infection by a pathogen are generally immune to further illness caused by that same pathogen. In many species, the adaptive immune system can be divided into two major sections, the humoral immune system and the cell-mediated immune system. Antibodies (large Y-shaped proteins used to identify and neutralize foreign objects) are associated only with the humoral immune system. The humoral immune system acts against antigens in the body liquids (e.g., blood) by means of proteins called immunoglobulins, or antibodies, which are produced by B cells (a type of lymphocyte). The cell-mediated immune system, the second main mechanism of the adaptive immune system, uses T cells, also called "T lymphocytes," to destroy virus-infected cells (among other duties). Cell-mediated immunity is an immune response that does not involve antibodies, but rather involves the activation of macrophages and natural killer cells, the production of antigen-specific cytotoxic T cells, and the release of various cytokines in response to an antigen. Cells present their antigens to the immune system via a histocompatibility molecule. Depending on the antigen presented and the type of the histocompatibility molecule, different types of immune cells can become activated. An allergy is an abnormally high or misguided reaction by the immune system to various foreign substances that are normally harmless, such as pollen, molds, animal proteins, dust mites, insect poisons, and foods. An allergen is the substance—the antigen—that triggers an allergic reaction. An allergy is a type of hypersensitivity, a term that refers to an immune response that damages the body's own tissues. Allergies are generally considered to be the type of hypersensitivity involving an immediate (or atopic, or anaphylactic) reaction provoked by exposure to a specific antigen. This hypersensitivity involves the interaction of the antigen ("allergen" when a person is hypersensitized to it) with immunoglobulin E (IgE, a subclass of antibodies). This hypersensitivity is characterized by an immediate reaction, in which mast cells and basophils (a type of white blood cell) are excessively activated by immunoglobulin E. The mast cells and basophils release histamine, which results in a systemic inflammatory response that can cause symptoms ranging from a benign runny nose to life-threatening anaphylactic shock and death. Another type of hyperactivity that allergies can take the form of is called a cell-mediated (or delayed) reaction, as the reaction takes two to three days to develop. Unlike the other type, it is not antibody mediated, but rather is a type of cell-mediated response. The antigens (allergens) in this type of hypersensitivity, rather than interacting with antibodies, interact with T lymphocytes (white blood cells of the immune system). Antigens can be classified by their origins. Exogenous antigens are antigens that have entered the body from the outside, for example by inhalation, ingestion, or injection. By endocytosis or phagocytosis, these antigens are taken into the antigen-presenting cells (APCs) and processed into fragments. 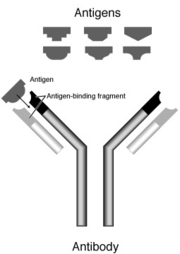 APCs then present the fragments to T helper cells (CD4+) by the use of class II histocompatibility molecules on their surface. Some T cells are specific for the peptide:MHC complex. They become activated and start to secrete cytokines. Cytokines are substances that can activate cytotoxic T lymphocytes (CTL), antibody-secreting B cells, macrophages, and other particles. Endogenous antigens are antigens that have been generated within the cell, as a result of normal cell metabolism, or because of viral or intracellular bacterial infection. The fragments are then presented on the cell surface in the complex with class I histocompatibility molecules. If activated cytotoxic CD8+ T cells recognize them, the T cells begin to secrete different toxins that cause the lysis or apoptosis of the infected cell. In order to keep the cytotoxic cells from killing cells just for presenting self-proteins, self-reactive T cells are deleted from the repertoire as a result of central tolerance (also known as negative selection, which occurs in the thymus). Only those CTL that do not react to self-peptides that are presented in the thymus in the context of MHC class I molecules are allowed to enter the bloodstream. There is an exception to the exogenous/endogenous antigen paradigm, called cross-presentation. An autoantigen is usually a normal protein or complex of proteins (and sometimes DNA or RNA) that is recognized by the immune system of patients suffering from a specific autoimmune disease. These antigens should under normal conditions not be the target of the immune system, but due to mainly genetic and environmental factors the normal immunological tolerance for such an antigen has been lost in these patients. Tumor antigens are those antigens that are presented by the MHC I molecules on the surface of tumor cells. These antigens can sometimes be presented only by tumor cells and never by the normal ones. In this case, they are called tumor-specific antigens (TSAs) and typically result from a tumor specific mutation. More common are antigens that are presented by tumor cells and normal cells, called tumor-associated antigens (TAAs). Cytotoxic T lymphocytes that recognize these antigens may be able to destroy the tumor cells before they proliferate or spread to other parts of the body. Tumor antigens can also be on the surface of the tumor. For example, in the form of a mutated receptor, in which case they will be recognized by B cells. Lichtman, A. 2006. The Immunology. Immunology.com. Retrieved August 11, 2006. Ono, S. J. 2000. Molecular Genetics of Allergic Diseases. Annu Rev Immunol. 18: 347-66. This page was last modified on 3 April 2008, at 17:44.